To celebrate the 25th anniversary of R.E.M.’s Fables of the Reconstruction, the album is getting the digital remastering treatment with a bonus disc of demos, new liner notes and some other goodies thrown in. Following in line with Murmur and Reckoning already getting remastered and reissued, Fables of the Reconstruction got its sonic nuts and bolts tightened up to take us for another spin. While some audiophiles may complain that the overall volume increase causes too much compression and distortion, I think it sounds great and really full. The vast majority of listeners will definitely appreciate hearing Michael Stipe’s voice better and hearing the cleaner separation in the instruments. Fables of the Reconstruction has always been categorized as having a dense or even muddy tone to it, so there may be some fans who nostalgically love it the way they’ve heard it for years and don’t want it messed with. They have nothing to fear. The remastering is not drastic enough to change the overall feel of the album. In fact, you can tell there was much love, attention and respect paid to reissuing one of the best albums of the 80’s alternative rock scene and a prime example of the “early R.E.M. sound” period. 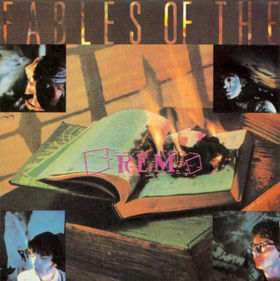 Fables of the Reconstruction is R.E.M.’s third full length album and it was first released in 1985. During a time of intense touring, increased social awareness and just plain getting older, Michael, Peter, Mike and Bill decided to approach their upcoming album a little different than the previous two. Where their first two albums were recorded with Mitch Easter and Don Dixon in North Carolina, R.E.M. travelled all the way to England and had Joe Boyd produce this one. The change in location and studio guidance was accompanied by a shift in their music as well. The lyrics dealt with the rural American South and had an almost homesick vibe to them, while the music was a little darker and less jangly than their previous efforts. Also, there was a little more diversity in the instrumentation with string sections (“Feeling Gravitys Pull”), banjo (“Wendell Gee”) and horns (“Can’t Get There From Here”) popping up. Overall though, this is still an R.E.M. album, one of their best in fact, and there is much to love about it. Micheal’s mumbly vocals, Pete’s chiming guitar work, Mike’s melodic bass lines and Bill’s steady drumming hold the album together and create a moody, celebratory, calm and explosive mood like only they can. Plus, my favorite R.E.M. song of their entire catalog, “Driver 8,” appears on it, so it will always hold a special spot for me. The shining star of the reissue though is the bonus disc dubbed The Athens Demos. Back then, the practice of a band roughly recording the anticipated album before spending lots of money on a big studio was an industry standard. Before heading off to London, R.E.M. ran through the songs for Fables of the Reconstruction with Jim Hawkins in his studio in Athens, GA. Where the songs on their previous albums had been written months, and sometimes years, before recording them, these new songs were still being finished up in the studio. The raw state of the songs, the chatter before, after and during the recordings, and the surprisingly good quality of the demos make this bonus disc an exciting treat for fans. The Athens Demos contain the eleven tracks that would appear on Fables of the Reconstruction, plus three other songs that didn’t make the final cut. Of those three songs, “Bandwagon” showed up as a B-side to the “Can’t Get There From Here” single, “Hyena” was recorded again for their next album and, while it would eventually morph into a song called “I Believe” that also appeared on their next album, “Throw Those Trolls Away” had been previously unreleased. Even if you’ve already got the original version of Fables of the Reconstruction, the 25th Anniversary remaster is worth the money. As if R.E.M. needed any extra validation, The Athens Demos prove that, even in a raw, rushed and undefined state, these four guys create exciting musical alchemy inside of unconventional atmospheres like nobody else. The 25th Anniversary edition of Fables of the Reconstruction will be available on July 13th.